Recently while on pilgrimage in Great Britain I found myself staying at the London Savoy on the eastern fringes of the city's West End. Crossing the Strand and walking up the hill for dinner at London's oldest restaurant, Rules, quite accidentally (by Divine Providence you might say) we happened to walk by Corpus Christi, Covent Garden. Such a find! Alas, the door was locked. However, upon returning the next morning for a quick visit, what I saw was nothing short of breathtaking. The entire interior of this hidden gem, located in London's main theatre and entertainment area, has been completely renovated and restored with great care and detail to its original splendor. It is very rare (and equally satisfying I might add), to see a renovation done so properly. The renovation itself allows the church to more adequately show that our lives have a transcendent purpose. Dating back to 1874, Corpus Christi is one of London's best kept secrets. Tucked away from the hustle and bustle of the busy urban metropolis, the ancient temple informs the city. As English philosopher Sir Roger Scruton would say, "The classic temple is not an enclosure but a precinct, permeable to the city and its commerce...while retaining the inner sanctum." Here visitors find calm and experience divine apartness. Cardinal Manning founded the parish as the first post-Reformation church dedicated to the Body and Blood of Our Lord, intended to make reparation for sins against the true presence of Our Lord in the Blessed Eucharist. He specifically dedicated the church for the purpose of being a sanctuary to promote adoration of the Blessed Sacrament. After years of age and neglect, the church was ready for a complete makeover. Due to age and pollutants, the soiled walls and aged plaster works, whitewashed statues and Artex surface coatings were removed, renewing the entire original look of the church. The first photo below depicts the restored sanctuary with re-gilding work and redecorated reredos and walls. The photo beneath that depicts the Lady Chapel with new altar and statue of Our Lady of Walsingham, a famous pilgrimage destination near London. On Sunday, June 3, 2018 His Eminence Vincent Cardinal Nichols will celebrate Pontifical Mass at Corpus Christi in celebration of the completion of the five year renovation, coinciding with the titular feast of Corpus Christi. Covent Garden is a major tourist attraction and one of its best attractions is Corpus Christi. I highly recommend every visitor make time to see this beautiful place; stay for Mass and a holy hour. You can be assured you will feel a sense of awe and wonder, a longing for the Holy Eucharist and all things heavenly. The silence of the place, combined with beauty of the art, make it a calm oasis, a perfect destination for all weary travelers. In the rear of the church on a bulletin board is this quotable quote from Lord Fellowes, writer of 'Downton Abbey', speaking of Corpus Christi: "In the world we live in, faith, and a still and holy place to nurture it, has never been more important." 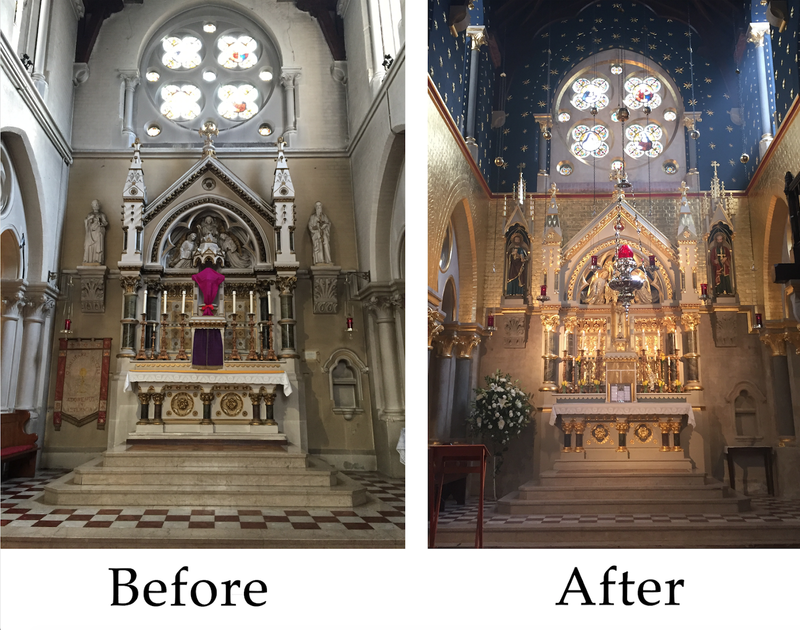 News of the renovation, with incredible before and after photos, can be seen on the parish website here.